Here it is almost August and I’m still catching up on posts from the beginning of July! I’ve been having a blast at the Lake Apopka Wildlife Drive this summer. My dad joined me for a July 4 visit to celebrate Independence Day. As usual, we saw tons of great birds! Yep, that was one big fish! 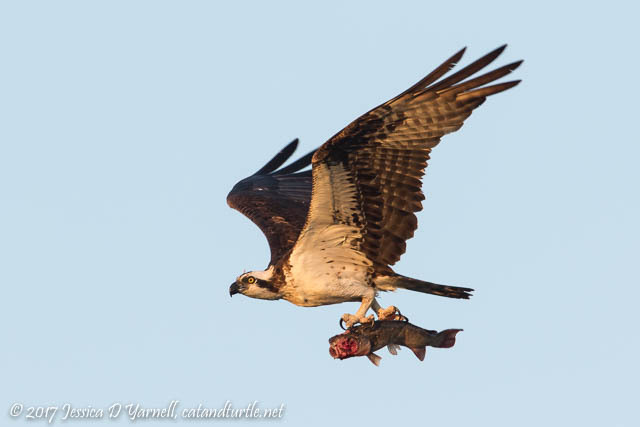 The next Osprey wasn’t quite so ambitious. He was, however, very loud. There is such a thing as having too much lens. 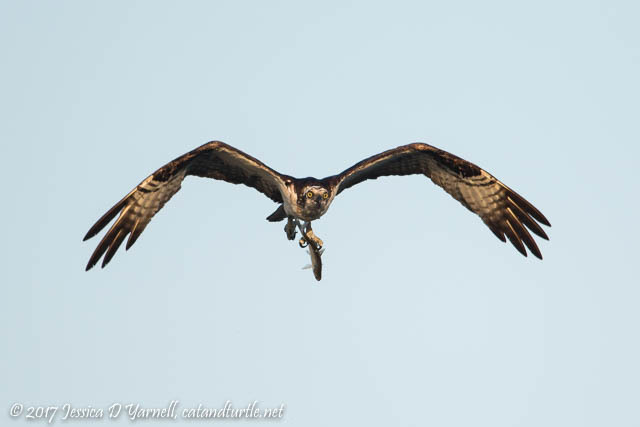 When the Osprey flew right over my head, I got a very good view…of his fish! 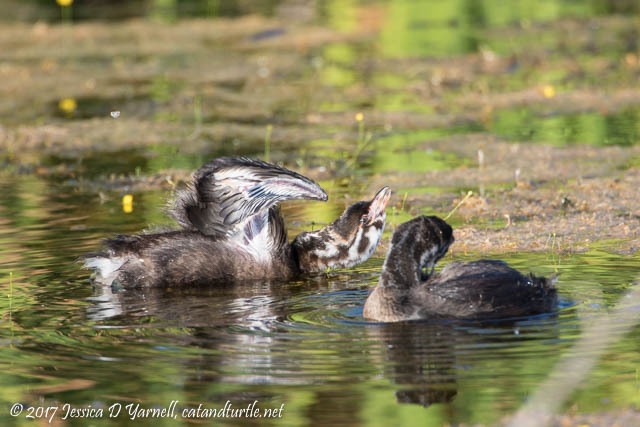 We found two Pied-billed Grebe babies hanging out with Mom not too far from Grebe Corner. They were in some pretty water that reflected the green reeds behind them. One of the babies was trying out his newly-grown wings. 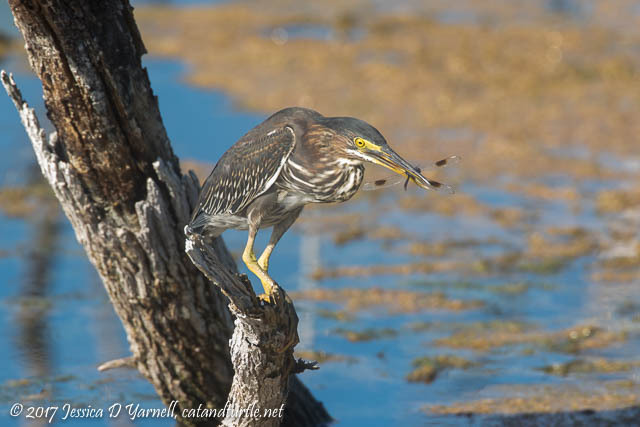 Our next bird was a Green Heron with a dragonfly. He stood on his branch crunching away while we scrambled to get our cameras focused on him. As we headed down Laughlin, we were on the lookout for orioles and cuckoos. 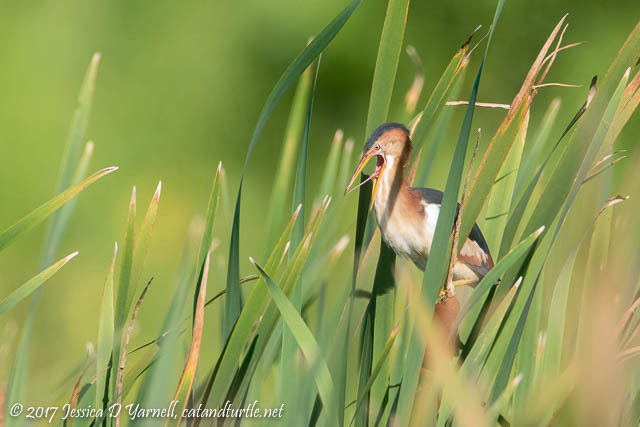 I almost drove past this Least Bittern posing on top of some cattails. I had to back up a few feet to get his picture while the bird yawned at me. 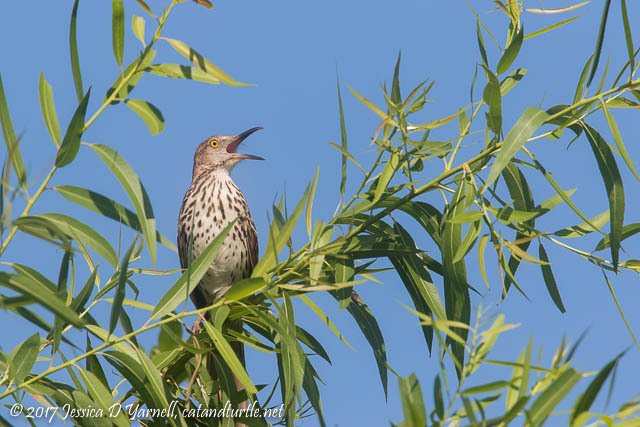 We didn’t find an oriole or a cuckoo, but we did spot this Brown Thrasher singing at the top of a tree. We sat and watched him for some time before he flew. I love his cheerful song. Then my dad totally lucked out. We pulled up to the Swallow’s Bridge on Interceptor Road, got out, and he scored two lifers just sitting on the power lines. Usually you have to work a little harder for lifers! 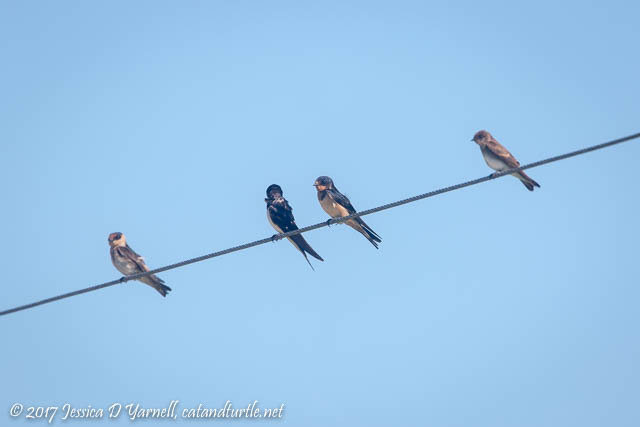 Lined up on the powerline were a Cave Swallow, two Barn Swallows, and a Northern Rough-winged Swallow. How kind of them to pose together for a nice comparison! Our attention didn’t stay long with the swallows. 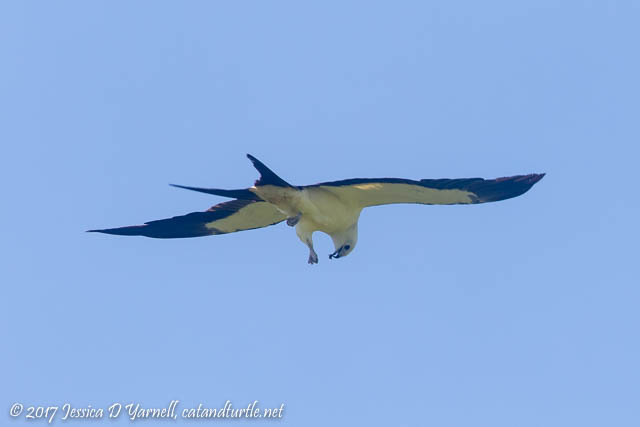 A flock of at least 100 Swallow-tailed Kites flew in over the large field south of the sod farms. Soon our cameras were clicking furiously as we photographed these beautiful birds catching insects in mid-air. 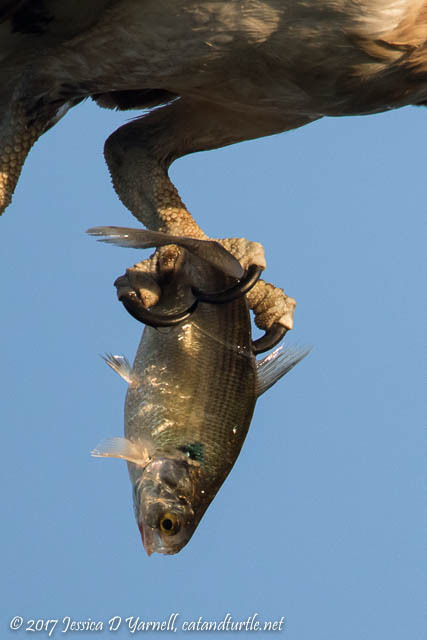 I loved this last image as the bird looked back at me with a bug in his mouth.